River Pointe, an active adult community in Manchester NJ. 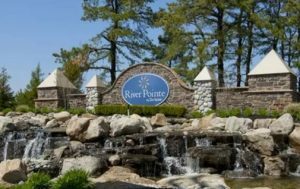 River Pointe is an Active Adult gated community in Manchester, Ocean County, NJ. As of 1/22/19 new construction is almost sold out. However, resale homes are often available. Just north of Route 70, it’s near The Lakehurst Naval Air Station. For your information, that was the site of the Hindenburg disaster. It’s ideally located because it’s near to shopping malls, beaches and much more. There’s a homeowners association, therefore a monthly association fee will be assessed. The HOA takes care of lawn maintenance and snow removal. Consequently, you don’t. Starting in 2007 over 500 homes were built in River Pointe. The community started with 8 different model homes available. And, over the years a few other models have been added. The homes have either 2 or 3 bedrooms and a 2 car garage. And some models have a loft that adds a third bedroom. Sizes generally range between 1,269 2,799 square feet. In addition, your pets are welcome in River Pointe. The social center of River Pointe is the 16,000 sq ft clubhouse. You’ll find a library, card rooms, tennis, bocce and more. No matter what the weather is, you can swim because there are indoor and outdoor pools. Also, there’s a fitness center for those who want to stay in shape. And when your computer goes down, there;s a computer lab. Even though this is not a golf community, there are numerous public golf courses in the area. Numerous clubs are available to join, and trips are planned. You can be as active or as in-active as you want. River Pointe has a great location because it’s only minutes to The Jersey Shore. Also, Atlantic City is about an hour’s drive away. You can enjoy local activities such as fishing, boating, shopping, dining and much much more. Ocean County provides a county transit system, Ocean Ride. This offers bus transportation throughout Ocean County. The Reserve-A-Ride Program provides non-emergency medical transportation service to seniors. Advance reservations are necessary, however a fee is charged. Ocean Ride also has 12 local bus routes to shopping, other adult communities and more.This is a free program, but many of the riders tip the driver. When you’re ready to either buy or sell a home in River Pointe, contact us. Call Bunny and Art Reiman – the Active Adult Community Specialists.